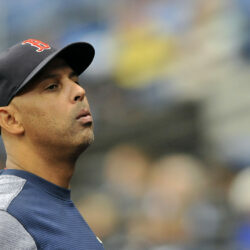 Boston recovers from a doubleheader sweep as J.D. Martinez has three hits and Eduardo Rodriguez pitches six sharp innings. Chris Sale strikes out 10 in the first game, a 7-4 loss; Detroit scores three in the fourth to win the second game, 4-2. 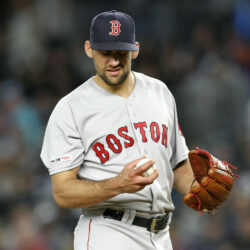 Red Sox starting starter Nathan Eovaldi will have surgery on his right elbow to remove loose bodies. Boston, no longer a lovable loser, is starting to play like the envied champions it is. 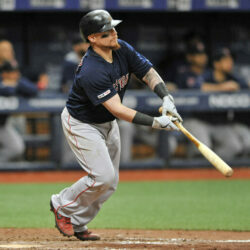 Christian Vazquez, noted for his defensive skills, also has displayed power this spring. Michael Chavis goes from waking Friday in Syracuse to becoming a Red Sox second baseman by Sunday. Christian Vazquez hits a sacrifice fly and Boston wins its third straight game. Andrew Benintendi hits a grand slam, then breaks a tie with a ninth-inning sacrifice fly as Boston beats Tampa Bay, 6-5. The right-hander has a loose body in his pitching elbow.